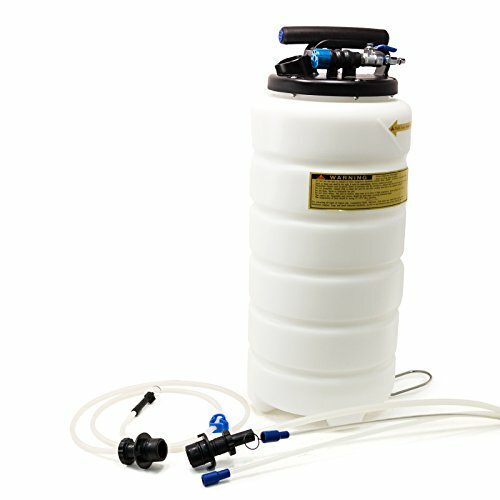 View More In Fluid Evacuators. ◆ Include 1.5 meter silicon brake bleeding hose with one touch control valve & universal rubber adapter, can fits to most type brake fittings. ● Two air outlets with check valve design on handle for easy & quick to release the air from the extractor. ● Easy to operate suitable for engine oil, gear oil, brake fluid, water. ● Provide with new design decompression valve for easy to relesae the negative pressure. ● Fixing valve & safety cup for automatic cut-off extracting. ◆ Air Inlet : 1/4"
Two functions oil changer-manual & pneumatic - Quick extraction on pneumatic mode, 1.6L/min. - Oil changing anywhere without compressor on manual mode. Widely used for fluid extraction - engine oil, gear oil, brake oil, coolant, water, etc. Connected hoses fits car, marine, lawn mower and industrial machinery. Extraction without car lifted up! Special angle spout design makes everything clean. Changing oil, your best partner!